World War I brought about great political and strategic changes. We acknowledge the political and strategic links joining World Wars I and II, but we seldom acknowledge the link of trauma that ties the brutalities visited on the combatants of the first war to the systematic mass killings of civilians in the second. The impact of the Great War echoes strongly through the generations, but to understand its impact we need to remind ourselves of the conditions endured by combatants. This was like a holocaust of young men, a multinational holocaust which even enemy states shared in common. It was one of histories great obscenities akin to a genocide or the horrors of the Atlantic slave trade, and it sowed the seeds of even greater future suffering. Psychologically the world was primed for an unprecedented turn towards genocide. We cannot forget that the experiences of Great War combatants were diverse, but at the same time we would be extremely foolish not to acknowledge the singular historical significance of the unprecedented sharing of such extreme conditions among tens of millions of young men. Never before have so many from so many nations shared so much with each other that they did not share with the rest of humanity. The reactions were also diverse among returned servicemen. An societal embrace of pacifism was a natural reaction, often shared by veterans, but other brutalised men were all too ready to don the uniforms of paramilitary police or fascist militias. The resentment of civilian impunity worked its way into military doctrine. Three early advocates of mass aerial bombardment were Giulio Douhet (Italy), Hugh Trenchard (Britain), and Billy Mitchell (US). Douhet and Trenchard argued against the distinction between civilian and combatant, Mitchell was an advocate of incendiary bombing, and all three argued that mass bombing of urban areas would shorten wars, preventing the horrors of drawn out trench warfare.lxii Thus, even without recourse to Nazi racial theories, it became quite normal in some circles to think that the mass-murder of civilians was a normal and desirable part of warfare. 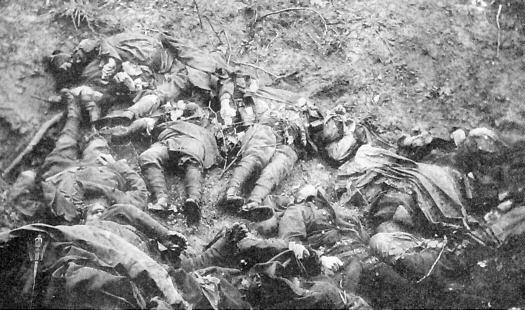 The callousness with which war leaders had used young men in the Great War sowed the seeds of genocidal brutality for the next generation of war leaders. These leaders would lay waste to entire countries and collectively slaughter tens of millions of civilians. iYehuda Bauer, A History of the Holocaust. New York: Franklin Watts, 1982, pp 58-9, quoted in Eric Markusen and David Kopf, The Holocaust and Strategic Bombing: Genocide and Total War in the Twentieth Century. Boulder, San Francisco, Oxford: 1995, p 30.
iiMichael C.C. Adams, The Great Adventure: Male Desire and the Coming of World War I, Bloomington: Indiana University Press, 1990, pp 71-2.
ivEric J. Leed, No Man’s Land: Combat and Identity in World War I, Cambridge: Cambridge University Press, 1979, p 40; J.G. Fuller, Troop Morale and Popular Culture in the British and Dominion Armies 1914-1918, Oxford: Clarendon Press, 1990, p 37.
vDenis Winter, Death’s Men: Soldiers of the Great War, London: Penguin, 1979, p 32.
viMichael C.C. Adams, The Great Adventure: Male Desire and the Coming of World War I, Bloomington, Indiana University Press, 1990, p 61.
viiLeed, No Man’s Land, pp 44-5.
ixWinter, Death’s Men, pp 41-3. The destruction of individuality was also ipso facto the destruction of identity, or more specifically civilian identity, which was, in theory replaced with a less individual identity as a soldier. The problem, as we shall see, is that a soldier identity, as everyone understood it and as the military attempted to instil it, was totally untenable in the conditions of trench warfare (see below). xiLeed, No Man’s Land, pp 126, 131.
xiiIbid pp 124-5; Winter, Death’s Men, p 101.
xiiiWinter, Death’s Men:, pp 82, 226; Leed, No Man’s Land, p 21.
xivWinter, Death’s Men, pp 95-8.
xvIbid p 86, David Stevenson, 1914-1918:The History of the First World War, London: Penguin 2004, p 185; Fuller, Troop Morale and Popular Culture …, pp 76-8.
xviDenis Winter, Death’s Men: Soldiers of the Great War, London: Penguin, 1979, p 100.
xviiIbid pp 30, 102; Jock Phillips, Nicholas Boyack, and E.P. Malone (eds), The Great Adventure: New Zealand Soldiers Describe the First World War, Wellington: Allen and Unwin, 1988, p 9; Fuller, Troop Morale and Popular Culture…, p 60.
xviiiWinter, Death’s Men, pp 99, 201-2.
xixFuller, Troop Morale and Popular Culture…, pp 62-4.
xxLeed, No Man’s Land , pp 77-80.
xxiWinter, Death’s Men, p 100.
xxiiIbid, pp 213; Leed, No Man’s Land, p 99.
xxiiiLeed, No Man’s Land, pp 106-7.
xxvJoanna Bourke, An Intimate History of Killing: Face-to-Face Killing in Twentieth-Century Warfare, London: Granta, 1999, p 249. See also note 8 above. xxviiWinter, Death’s Men, p 133. Winter paraphrases Aldington as suggesting that men were ‘horribly afraid of seeming afraid’, however it is a reasonable inference to suggest that, given the risk of death or insanity that uncontrolled fear brought, they truly did fear fear. Such safety as there was against shelling required immobility, which required the control of fear. Again there are resonances with Catch-22. xxixIbid p 206-8. There is also the strong, if not cliché, narrative convention of the encounter with an enemy corpse prompting a realisation of the humanity of the enemy. For example, Erich Maria Remarque, All Quiet on the Western Front, London: Vintage, 2005, pp 153-9, wherein the protagonist is also confronted by a protracted death at his own hands. xxxLeed, No Man’s Land, p 210.
xxxiJoanna Bourke, Dismembering the Male, Chicago: University of Chicago Press, 1996, p 77.
xxxiiLeed, No Man’s Land, p 19.
xxxivJohn Keegan, The First World War, New York: Vintage, 2000, p 273.
xxxvLeed, No Man’s Land, pp 127-8; Winter, Death’s Men, p 118.
xxxviiCharles Carrington quoted in Leed, No Man’s Land, p 12.
xlLeed, No Man’s Land, p 113.
xliBourke, An Intimate History of Killing, pp 1-3.
xliiWinter, Death’s Men, p 216.
xlivBourke, An Intimate History of Killing, pp 150-1.
xlvDavid Grossman, On Killing: The Psychological Cost of Learning to Kill in War and Society, New York: Back Bay Books / Little, Brown and Company, 1995.
xlviiLeed, No Man’s Land, p 110.
xlixIbid p 107; in contrast Winter perceives more hatred, or rather ‘dislike’, but suggests that it seems to have been linked to the degree of danger and to have rapidly disappeared in time of truce, (Death’s Men, pp 209-13). liWinter, Death’s Men, p 167.
liiFuller, Troop Morale and Popular Culture…, p 17.
livAdams, The Great Adventure, p 133.
lvLeed, No Man’s Land, p 207.
lviiRemarque, All Quiet on the Western Front, p 9.
lviiiLeed, No Man’s Land, p 206; Adams, The Great Adventure, p 116; Fuller, Troop Morale and Popular Culture…, p 60; Winter, Death’s Men, pp 167-8.
lixAdams, The Great Adventure, p 108.
lxIbid p 128. Women were psychologically mobilised for the war effort and part of this was an effort to consciously indoctrinate them into viewing the death of their loved one’s as a positive sacrifice and a source of satisfaction. It seems unlikely that women were quite so thrilled at losing their sons as Aldington suggests, but the very existence of widespread propaganda to that effect makes Aldington’s viewpoint seem less extreme. See Nicoletta F. Gullace, “The Blood of our Sons”: Men Women and the Renegotiation of British Citizenship During the Great War, New York: Palgrave MacMillan, 2002, p 63.
lxiDavid Stevenson, 1914-1918:The History of the First World War, London: Penguin 2004, p 292; Nicoletta F. Gullace, “The Blood of our Sons”: Men Women and the Renegotiation of British Citizenship During the Great War, New York: Palgrave MacMillan, 2002, pp 3-4, 53-60, 81-3. ← The Korean Genocide Part 4: War or Genocide?